I took a chance on this very quick read after a friend recommended it. Though a literate, incredibly well-spoken people, the island’s inhabitants are thrown into complete disarray as a statue of Nollop begins to lose letters from the sacred phrase. They take these jettisoned letters as spiritual intervention, and so they remove each letter from usage as it falls. Because the book is written as literal correspondence between characters, a dark farce ensues. The messages begin missing those outlawed letters, and, by book’s end, the notes between characters are nearly incomprehensible. To make matters worse, the town punishes anyone caught using the banned letters. Beatings, exile, even death can result as a byproduct of usage. Things get very bleak very quickly, yet the circumstances continuously remain hilarious. While the story itself did not make a lasting impact upon me, Mark Dunn’s execution absolutely impressed. To literally omit those letters banned by the town in the actual story — that’s no easy feat! I enjoyed the structure, construction, and style of the book immensely, and I would recommend reading it for that experience alone. 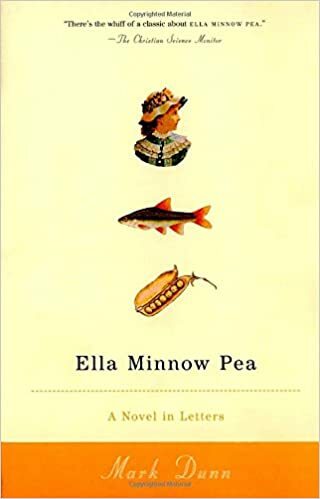 This entry was posted in Book Reviews and tagged arts, book, ella minnow pea, entertainment, fiction, literature, mark dunn, review.